This is a sponsored post written by me on behalf of Ohio Pork Council All opinions are my own. 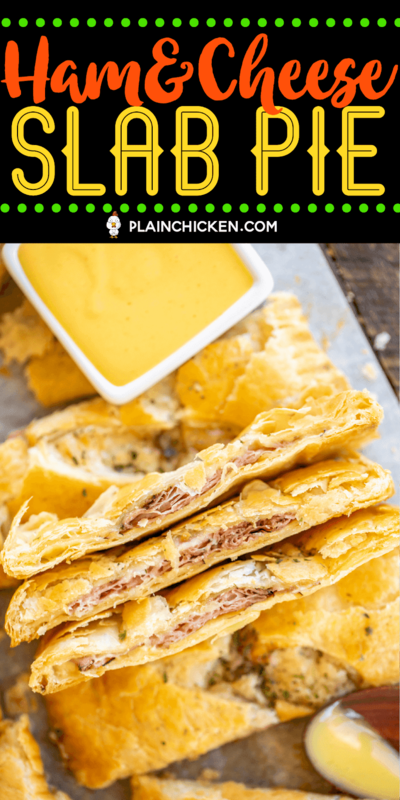 Ham & Cheese Slab Pie - delicious hot ham and cheese puff pastry sandwiches. 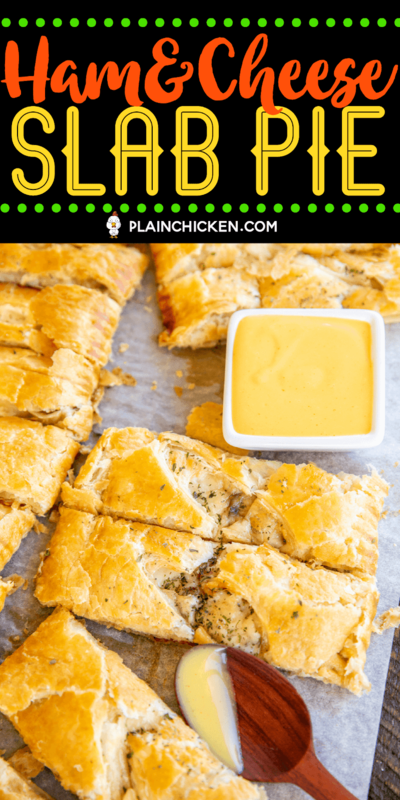 Only a few simple ingredients - ham, swiss cheese, cream cheese, honey mustard, and puff pastry. Brush pies with an egg wash to get a nice golden color. We love these for breakfast, brunch, lunch, and dinner. 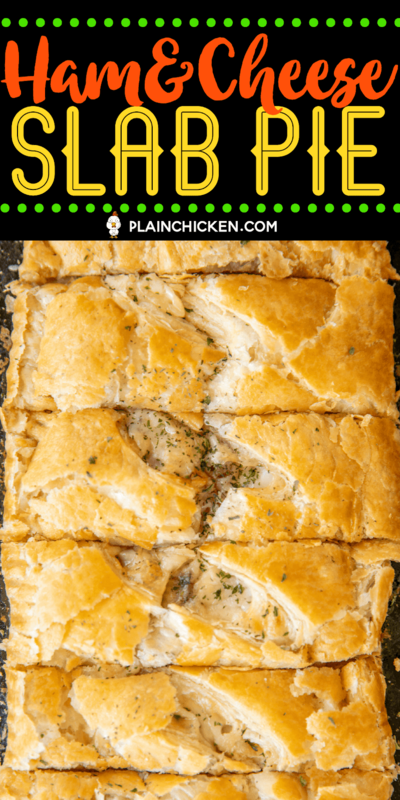 Can make in advance and freeze unbaked for later! A great alternative to plain ham and cheese sandwiches! I am a sucker for anything ham & cheese. This Ham & Cheese Slab Pie is no exception! 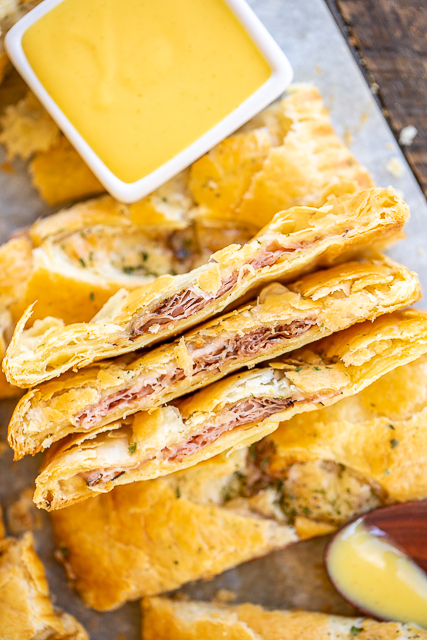 Puff pastry filled with ham, Swiss cheese, cream cheese and honey mustard. YUM! SO simple, yet SO delicious!! We like to serve the pies with some extra honey mustard for dipping. The crust for these Ham & Cheese Slab Pies are made from store-bought puff pastry. It is in the freezer section. You will want to thaw the puff pastry before assembling the pies. The pies come together in minutes. Just lay the puff pastry flat, place ham, honey mustard and Swiss cheese on half of the puff pastry. Fold the other half over and seal the edges with a fork. I brushed the assembled pies with an egg wash so they got that pretty golden color. I used some very thinly sliced deli ham. I prefer Boars Head Virginia Brand Ham. Don't skimp on the ham! It is the main flavor in these pies. You don't want cheap ham. 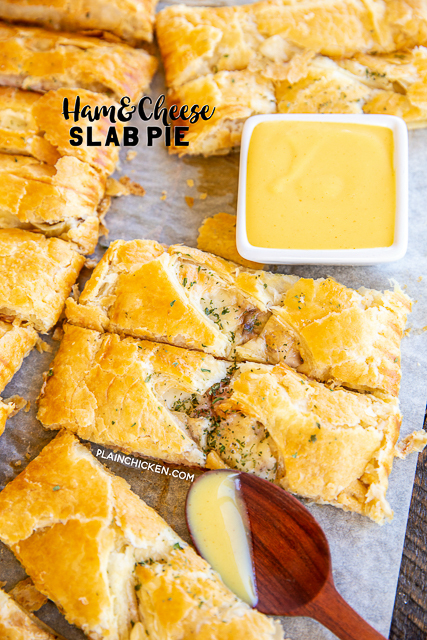 I used Swiss cheese in these Ham & Cheese Puff Pastry Slab Pies. Feel free to swap it for your favorite cheese - cheddar, Monterey jack or gouda might be nice. 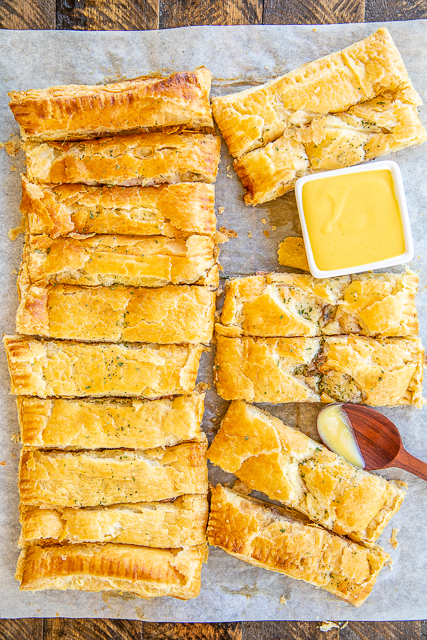 Can You Freeze these Ham & Cheese Puff Pastry Slab Pies? Absolutely!! 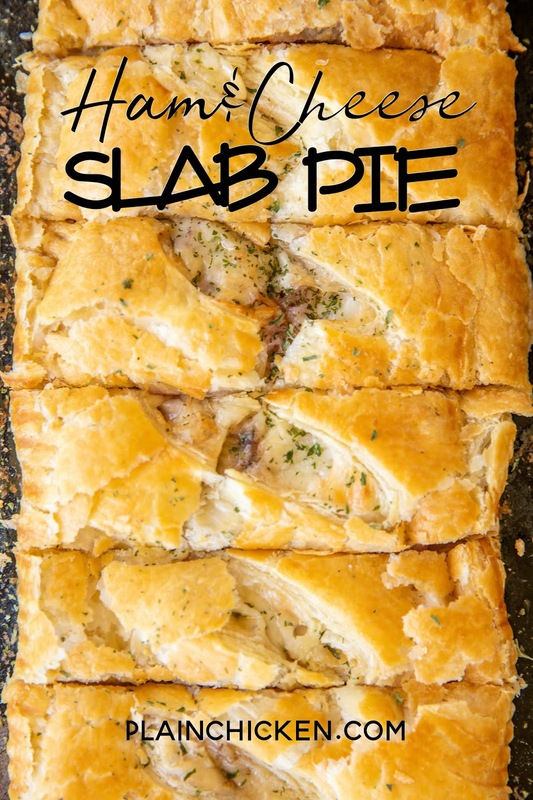 This recipe makes two slab pies. You can bake one now and freeze one unbaked for later. I love recipes that are double duty! If baking after freezing, thaw the slab pies and bake as directed below. 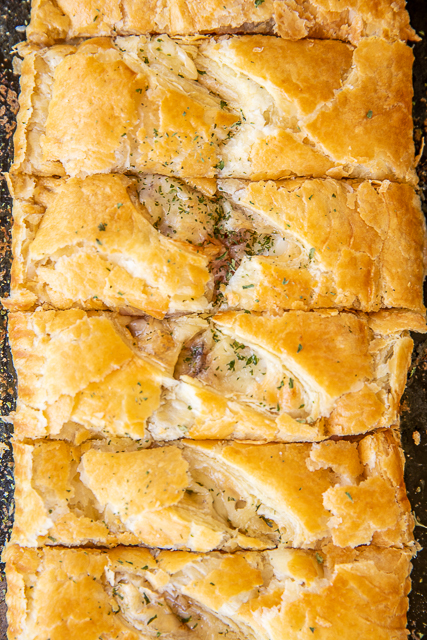 What to Serve with this Ham & Cheese Slab Pie? These Ham & Cheese Slab Pies are great for breakfast, brunch, lunch or dinner. We prefer to eat these pies hot out of the oven, but they are also delicious at room temperature. Perfect for parties and tailgating! Preheat oven to 400°F. Line two large baking sheets with parchment paper; set aside. In a small bowl stir together cream cheese and mustard. Roll each sheet of thawed puff pastry into a 15x12-inch rectangle. Transfer each pastry sheet to the parchment lined baking sheets. Spread half of each puff pastry sheet with cream cheese mixture, leaving a 1/2 inch border around the outer edge. Place 1/2 of ham on top of cream cheese spread on each puff pastry sheet. Top ham with cheese slices. Fold uncovered portion of each puff pastry sheet over filling. Use a fork to seal edges together. Whisk together egg and water. Brush tops with egg mixture. Cut a few slits in top of each pastry. This will help the steam escape. Bake for 25 minutes, or until golden. Cut into strips to serve. 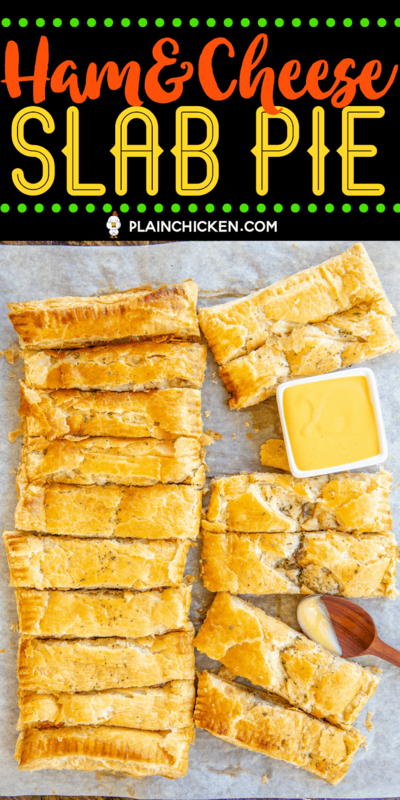 Can freeze unbaked ham & cheese puff pastry slab pies. To bake, thaw puff pastry and bake as directed above. omg - ham & cheese and puff pastry - i want some now!!!! I love sections about freezing and side dishes you've been adding. Those are always my questions as I read the recipe. THANK YOU!! Yay! I'm so glad to hear the new format is helpful!